On Monday December 29th the Carolina Hurricanes did not get the victory that they had hoped against the Montreal Canadiens but they did get a BIG piece of their line up back…. Jordan Staal! The Assistant Captain made his first appearance of the season after returning from a broken leg that was suffered in a preseason game against Buffalo back in September. With the calendar turing to 2015 and Jordan back in the lineup the Hurricanes are starting to put the pieces of the puzzle together. They opened with 2015 with a game against Metro Division rival the Philadelphia Flyers; the Flyers who are also in an uphill battle came ready to play. Brad Malone started the scoring getting his first goal of the season; Malone over the past 4 games has played his best of the season and starting to show some chemistry with his line. 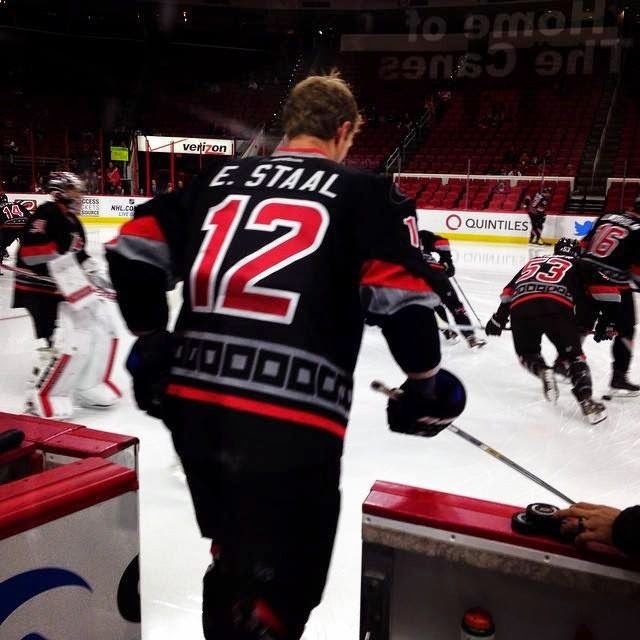 In the 2nd period Jordan Staal set his brother Eric up for this 10th of season. That goal extended Eric’s Point streak to 4 games and put Jordan 2 points in 2 games so far this season. The 2 goals were all the Hurricanes need to put the Flyers away and walk away with 2 points. In a post game interview the Captain said it best about what the difference maker was; he showed a smile and said “we got 2”. It has been hard for the Hurricanes this season getting more then one goal but for 2015 it seems the tide has shifted. On a rare early Sunday afternoon game the Hurricanes faced the Boston Bruins who came to town on the back end of a back to back situation that saw them lose the afternoon before to the Senators in OT. 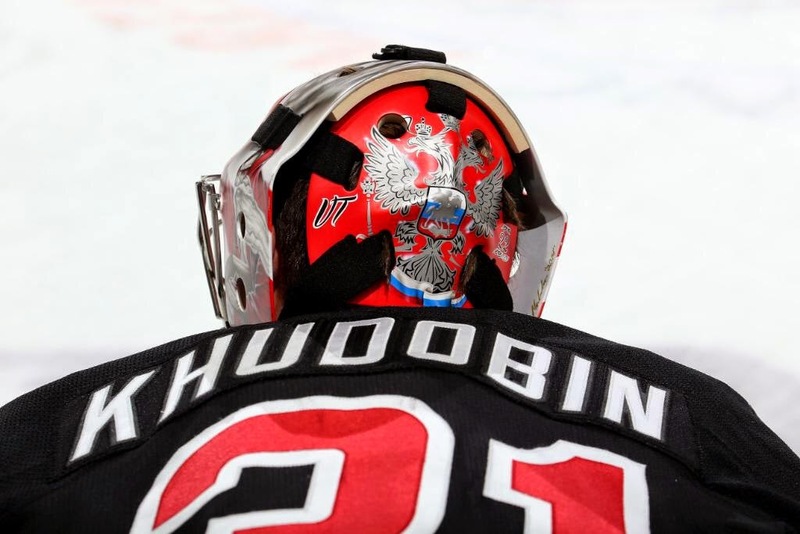 The Hurricanes got a first period goal from Patrick Dwyer to close out the 1st period but what key to the first period was that Khudobin did not see a single Bruins shot till almost the 17 minute mark of the 1st period. The Hurricanes continued to show dominance in all the zones for the 2nd and 3rd period. Boston finally got one past Dobby late in the 2nd but that would be the only Boston goal on the board. The game needed extra time that took a unique turn in the OT period; there were matching penalties that allowed fans to see some 3 on 3 hockey. 3 on 3 OT hockey is something the coaches and league are looking into for the future of the NHL. Plenty of shots in OT but nothing saw the back of the net so we went to a shootout. The 3 shooters for Boston were Reilly Smith, Torey Krug, and Patrice Bergeron and the 3 shooters for the Carolina Hurricanes were Chris Terry, Jeff Skinner, and Eric Staal. The only player to find the net was Eric Staal; earning the Hurricanes the extra point, their 2nd win of 2015 and earning Eric the Hurricanes Fireman Helmet. This win also got Dobby his first win against his former team and his second win of the season. The Hurricanes are in Nashville tonight to try and extend their win streak to 3 for 3 in 2015. This is also the annual Father’s Trip for the Hurricanes as well. The Hurricanes return home on January 8th to face Buffalo.